The FlexMASSter® ST98 Flow Meter Series from Fluid Components International, with its precision thermal dispersion mass flow sensor and highly intelligent digital electronics, is now compatible with the HART communication protocol for use in large scale process and plant automation systems. 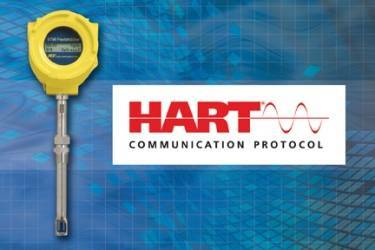 HART is a field-proven instrumentation communications protocol that is easy-to-use and provides reliable two-way digital communication without disturbing the integrity of the 4-20mA analog signal. HART communications permit remote process variable interrogation, cyclical access to process data, parameter setting and diagnostics. Unlike other technologies, HART provides a unique communication solution that is backward compatible with the installed base of instrumentation in use today. FCI’s ST98 Flow Meter with HART communications provides reliable measurement, quick data transmission and interoperability for process and plant engineers in search of a flexible, accurate air/gas flow meter. The ST98 with HART is now a drop-in network replacement instrument for any other HART-compatible flow meter, providing process flow rate and totalized flow data in a matter of minutes. With two-way HART communications, process and plant engineers have simplified control and access to important ST98 flow data. Diagnostics, calibration and configuration information also are available via HART. FCI’s HART manufacturer’s ID is 0000A6, and the ST98 device type is 0078. With an advanced thermal mass sensing element, the ST98 Flow Meter provides rigorous flow measurement over a wide flow range. It features high accuracy to ±1% of reading, plus ±0.5% of full scale. Exceptionally consistent, the ST98 offers repeatability to ±0.5% of reading. The inline style ST98 features an exceptionally wide flow range from 0.01 to 3140 Nm3/h in air at standard conditions for 21.2°C and 0°C and 1013,25 bar (a), typical for most gases. The ST98 offers low-flow sensitivity yet is able to operate from 10:1 to 100:1 turndown ratio and is field adjustable within the calibrated range. The ST98 flow meter is extremely flexible and dependable. It is suitable for service in numerous process gases, hydrocarbon mixed or dirty gases, biogases including methane, and plant compressed air and HVAC systems. The ST98 has been installed in plants worldwide, including a wide range of industries such as chemical, energy production, food/beverage, oil/gas, pharmaceutical, pulp/paper, steel, wastewater treatment and more. Two all-welded 316L stainless steel thermowells, protecting two matched platinum precision resistance temperature detectors (RTDs), comprise the ST98’s thermal mass sensing element. With a highly reliable no-moving parts design, one RTD is heated relative to the reference RTD, and the temperature difference between the two is related to the process gas mass flow rate. The ST98’s transmitter converts the differential temperature to a standard 4-20 mA output signal that has been linearized during the FCI factory NIST traceable calibration of the flow element. The ST98’s transmitter with its RS232C communications port is housed in either a NEMA Type 4, Type 4X (IP66) enclosure or an explosion-proof enclosure and can be integrally mounted to the flow element or remotely mounted up to 500 feet away. In addition, an LCD display screen indicating flow rate, temperature and totalized flow is available as an option. Fluid Components International is a global company, represented in Australia by AMS, committed to meeting the needs of its customers through innovative solutions to the most challenging requirements for sensing, measuring and controlling the flow and level of air, gases and liquids.